Thought you were keeping up? Check again. As of Tuesday Twitter has become a completely different platform. It doubled down on the visual web. More specifically, images once attached as pic.twitter.com are now streamlined to show up right in people’s feeds. There is no more need to click on the tweet to reveal the image in the card. Tweet previews (the name for images in timelines) do not require links anymore, saving character space in tweets. Tweet “actions” (reply, retweet, email) are now available directly from the home timeline. This is now essentially display advertising on Twitter but without the additional spend. Brands will still pay to promote but are getting a much bigger “bang for their buck” on a tweet that now has an embedded image. Intentionally or not, brands are already starting to make use of this feature. There are however, sizes and small details to pay attention to. The MightyHive blog gives us the tips to make in line Twitter images a success. Photos now have a new size – bigger and better than ever before. Photos are 25% percent bigger in the new one column format. Facebook photos squares are now 504 x 504 – a size to take advantage of! Left menu sections are now moveable! Everything that is not a page post is now in the left side bar – you can easily move these sections by clicking manage sections with the pencil icon and dragging wherever you wish. The activity tab now is home to messages and notifications – you can view, respond, and manage messages on your page from the tab. 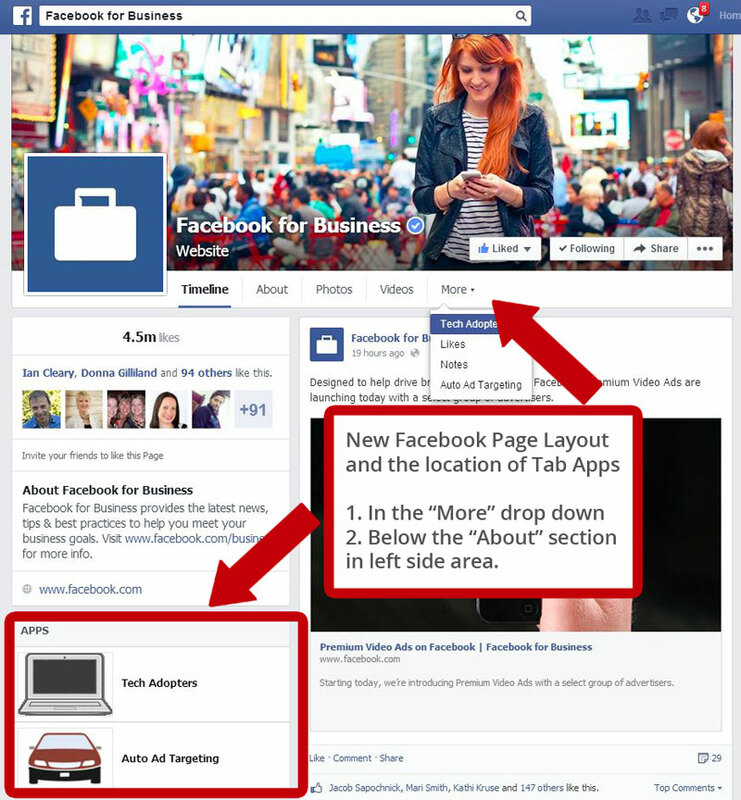 The Facebook “Use as Page” Option has moved – to find it, you must click the drop down arrow at the top right of your Facebook page. From there, click “Facebook Use As” and select the page you would like to use. The “About” section of your Facebook automatically displays the URL link to your Facebook page – a link that you had to use hacks to retrieve before, is now easily accessible right on your Facebook! If you have a local business page, your reviews will now be easier to find and read. Located right under the profile image at the top left of the page, simply scroll over see a breakdown of your ratings. Posts to page are now more visible and, like everything else, has moved to the left side of the page – larger and more visible than before so you can be sure not to miss it! They key settings of your Facebook are now bundled in one area under the settings tab – make it easier to find and update! Snapshots of page action are now available – the snapshot allows you to look over statistics of the week just by hovering over different areas of Facebook, such as page likes or post reach, to see more information. These little but significant changes to Facebook are important to know and understand, both for personal and business use of Facebook. Social Media Examiner does a great job on elaborating why!